Diablo IPA NET WEIGHT 2.86 POUNDS (1300 GRAMS) This recipe will produce 2 gallons of beer in approximately 2 weeks. A fiendishly hopped American IPA. Fiery amber in color with intense mouthfeel, displaying a blend of floral spice and stonefruit aromas with a firm and lingering bitter finish. For those not afraid of hops! 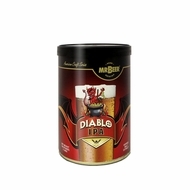 REFILL INCLUDES: 1 Can Diablo IPA HME 1 Packet Dry Brewing Yeast (under lid of HME) 1 Packet No-Rinse Cleanser INGREDIENTS: MALTED BARLEY, HOPS, WATER, AND YEAST (Under Lid). MR.BEER® refills feature a complex blend of Pale malt, Caramel malt, Chocolate malt, Vienna malt, wheat malt and Munich malt. Our malt extracts are brewed exclusively by the master brewers of Coopers Brewing in Adelaide, Australia.